$369.00 & FREE Shipping on orders over $59. 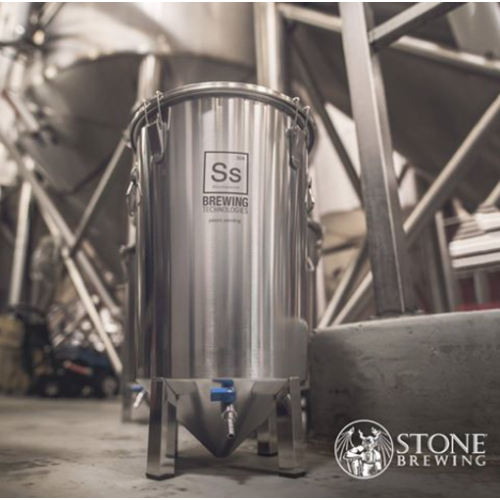 Upgrade your home brewery with an innovative, Stainless Steel, 14 Gallon Brew Bucket™ Fermenter! 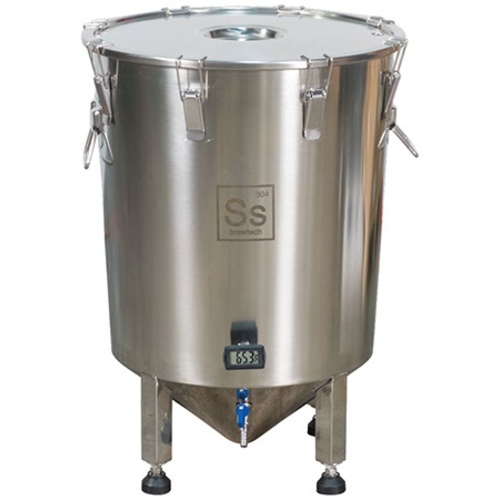 You will enjoy many of the benefits of a stainless conical fermenter but at a fraction of the cost and you are going to love how easy it is to use! 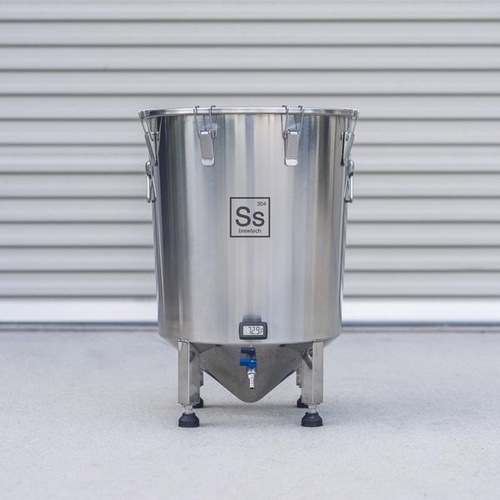 Made by Ss Brewing Technologies from polished 304 Stainless Steel, the Brew Bucket™ fermentor is not only functional it is downright beautiful. At MoreBeer! we know brewing equipment and we truly believe this is a piece of equipment you are going to enjoy using every brew day. We inspected and used the Brew Bucket™ and one of the most unique features that stood out is that the Brew Bucket can be stacked during fermentation, even with an airlock attached. We also like the conical bottom that allows trub to settle out in a concentrated space that minimizes the surface area of the trub that is in contact with your beer. The included Patent Pending Rotating Racking Valve is also a brilliantly simple design allowing you to rotate the racking arm inside the Brew Bucket down during fermentation to minimize trub, and later up to get clear beer when racking! Etched Volume Markers on the inside were super handy when filling and display in both Liters and Gallons. The build quality is really amazing for the price. Welds are clean. The lid is strong and the spring loaded lid hatches are solid. The lid includes a removable, molded silicone gasket that ensures an airtight seal. We love an airtight seal so that we can be sure to see the airlock working. The welded on stainless handles make the BrewBucket fermentor super easy to move. Overall: Very functional, easy-to-use, will last a lifetime, and looks amazing. Lets make some beer! Only used this beauty once so far but construction was minimal and easy and it turned out a great beer for me. It couldn’t be much easier to use. I made an 11 gallon Amber ale and it was terrific. It left the yeast in a nice little cone on the bottom and was easy to avoid it during the keg transfer. Great choice for an advanced home brewer that wants something close to a conical without spending a ton of money. I also loved the thermal well. No more taping the probe to the side. This thing should last forever and will hopefully be the last fermenter that I ever need. Beautiful piece of stainless steel equipment any homebrewer would love to have. Works great, cleans up easily very well-made. I Purchased a 7 gallon brew Bucket and decided I wanted to make larger batches of beer. The 14 gallon works very good, is made beautifully, and the thermometer is a nice addition. The gasket on the lid and the latches hold the lid tight. Using a half inch silicone hose for the blowoff tube fits perfectly into the hole in the top of the lid. There are plenty of legs that have screw adjusters with rubber feet that make the unit extremely stable. You can't beat stainless steel and this unit is beautifully made. I would recommend this for serious home brewers.